CO, IA, IL, KS, IN, MI, MN, MO, ND, NE, OH, SD, and WI. Big performance and Rotary Park course record from Brookfield Central senior Carl Hirsch last night to kick off his cross country season. Knowing that it was a 90-degree day and muggy setting at Rotary Park, I’m going to predict he will be posting some sub-15s this year. Carl was 5th last year in state cross and took a defining leap in track at the WIAA state meet (1:48.89 split, 4:08.21, 9:12) producing arguably the best distance triple our state has seen. 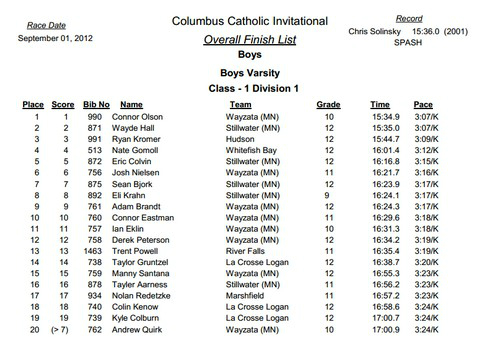 Wayzata and Stillwater just rocked the WI #3 team, La Crosse Logan, at the Columbus Catholic Invite in Marshfield, WI. Olson took down Chris Solinsky’s course record too. This is a tough course so times are probably 15s slower than UW-Parkside. Alli Cash ran 13:46 for 4K XC this morning in hot, humid conditions. She also won by over two minutes. She clearly won by 1:59.9. EDIT: I don’t think I’ve ever seen a 1-5 split that big in a 5K, let alone a 4K. Is Logan actually the #3 team in Wisco or is that a slightly off pre-season poll or something? I still don’t understand how our foreparents came up with the “Midwest”. Most of those states so much closer to east. It’s a legit claim that they are near the top and the pre-season rankings indicated that they were #3. Last year they looked great on paper coming out of the 2011 season but it looks as though their nucleus has plateaued. EDIT: They are #4 in Week 2 of the WCCCA rankings. Stevens Point looks great and they have been without their #1 runner (4:21/9:26 in the spring). They’ve got all their runners at or under 17:00 this year which is promising in the WI. The River Valley Invitational boys race featured three defending state champions(*) and 2011’s D2 runner-up, Trevor Wunnnicke. The official race results are split into Small Schools and Large Schools but I believe it is all run together and I assembled the actual top-10 race order below. The Spring Green course is a challenging course with times that are similar to what is seen on the state championship course. Today, Ryan McCoy of New Glarus blasted Chandler Diffee of Madison. The winning time lowers McCoy’s own course record from last year of 15:41. Anything under 16:20 here is worthy of some state elite recognition. In Marshalltown, IA, Chandler Austin of Boone (jr, 3rd last year in 3A) defeated Ben Anderson of West Des Moines Valley (sr, 4A champ last year and all time state meet record holder with a 15:02). Austin won in 15:26 to Anderson’s 15:29 with both of them under the course record of 15:38. Anderson ran 15:55 on the same course last year and went on to the 15:02 at the state meet. Austin is just a junior but is two for two on course records for the year after opening with a 15:41 in Webster City, taking 39 seconds off the old mark. Freshman girl in Missouri ran a 16:59 5K… She also ran 5:01 for the full mile in 8th grade. Future Jordan Hasay maybe? Cool story about Robert Murphy. 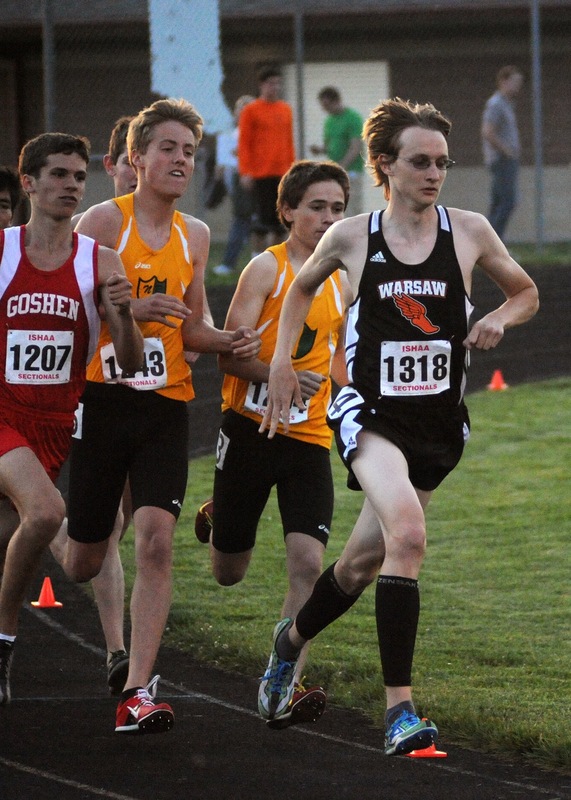 He has the best time for a number 3 runner in Indiana (16:06 I believe). Ryan McCoy of WI put away Tyson Miehe for the second time in 5 days on Tuesday at the Dana Waddell Invite in Marshall, WI. McCoy was 7s faster than last year while Miehe was 9s faster. At this point in time, Carl Hirsch of Brookfield Central has the most potential, we’ll see how he does at the HS Griak but McCoy, of New Glarus/Monitcello’s combined program, has solidified himself as another Footlocker/NXN type to watch in WI. Carl Hirsch went 15:22.1 on UW-Parkside this morning at the Angel Invite. It was a 17-second victory and second-best in-season time ever on that course from a Wisconsin boy. Great showing by FW Carroll, 5 in by 16:15 and 3 in at 16:00. Troy Reeder, probably Indiana’s top individual, wins in 15:19. I’ll be back later as soon as I can find Trinity and New Prairie Results. York cruised to the the Title of the Richard Spring Inviational on the state meet course at Detweiller Park in Peoria, IL this morning. Without Nathan Morz (the number 5 returner in Class 3A racing) who apparently did not run, the Dukes crushed the field of 60 plus teams including several ranked by the Illinois Coaches Association (O’Fallon 2nd; Palatine 6th; Maine South 8th; Sandburg 12thT; Wheaton North 12thT; Hersey 14th and Lake Park 15th. Also 2A Belvidere North 2nd and Deerfield 4th.